We have been doing Meat Free Monday for a few months now, albeit with varying degrees of success as I seem to have a blind spot as to the proper classification of chorizo and chicken stock. But, on the whole, we’ve managed it and it proved to be a great springboard for cutting back on meat more and more since. Radicchio, like its white and green chicory siblings, is not really loaded with vitamins but does contain folate, some vitamin K and lots of beta-carotene. It does though have higher levels of the antioxidant anthocyanin than its paler kin and is great for digestion. Nonetheless, my previous interaction with radicchio has been rather limited – I have always been rather wary of its bitterness. As somebody who willingly drinks Campari, this is really quite inexplicable and anyway I have now realised that the bitterness is rather beautifully tempered by the grill. The only outing radicchio ever used to get in our house was in Jamie Oliver’s superlative bacon, red wine & radicchio risotto. A recipe so good that I did once, on holiday in Italy, spend an hour picking the pieces of radicchio out of three mixed salad bags so that I could make it (what sort of Italian supermarket doesn’t have radicchio I ask you?). But that isn’t a recipe for this blog, for obvious reasons. This far more virtuous recipe comes from Diana Henry’s brilliant A Change of Appetite (see my ‘review’ of sorts here). My husband and I ate this last night at 10.30pm while watching Chuggington on Sky+ with our sick 2 year old. It was absolutely delicious – a perfect blend of sweet, bitter and creamy. I used water rather than chicken stock (it being Meat Free Monday after all. I didn’t substitute in vegetable stock because I find that nearly all (non-fresh ones) have an oddly synthetic flavour – even everybody’s apparently beloved Marigold). If you too use water, I would triple check that the purée is seasoned properly as it does need some oomph. If you do make the purée a little ahead of time, keep back some of the stock as you may need it when you reheat it later. On quantities – I made half the recipe for 2 of us and would in future make a bit more of the purée – you lose a fair bit moving it from blender back to pan (or at least I did) and as a dinner for 2 on its own half as much purée again would be welcome. The vegetable quantities were spot on. Do check how ‘grassy’ your olive oil is before adding the lemon juice to the purée. I use this Italian stuff from Waitrose at the moment and it’s lovely but quite fierce and I needed very little lemon juice. I threw the sliced onions and radicchio into the same bowl to dress with the olive oil and balsamic vinegar, forgetting that they were going to be cooked separately. It was a (relatively low level) faff to then pick the onion back out to cook it so if you don’t mind the washing up you could do these in separate bowls and split the dressing vaguely proportionately. 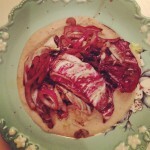 EAT WITH/TWEAK: As it comes! 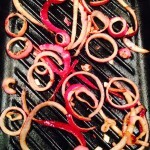 This would also make THE best accompaniment to liver (calf’s, lamb’s or even chicken) if you are that way inclined. But not on a Monday. 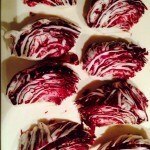 LEFTOVER RADICCHIO? Martha has all your answers here. Doesn’t she always?